Welcome to the website for “A Living Laboratory: Revitalizing General Education for a 21st Century College of Technology.” In the menus above you can explore the various project activities as well as many examples of the “Living Lab in Action” – work created by our Faculty Fellows. For more information about the project, check out About the Living Lab and Credits. We are very excited to invite you to the LL General Education Symposium on October 23, 2015 at 8:30 to 1:30 pm in N-119. We are finalizing the schedule and details of the event and an official invitation will be sent very soon. Please join us for a celebration of our accomplishments as we are transitioning to the institutionalization of the best practices developed during the five years of the grant and be there for the unveiling of the L4: the Living Lab Learning Library – a virtual resource exchange of innovative pedagogies! Look for an email with the full announcement of the event very soon and we hope to see you there! Last fall, Professors Sandra Cheng (HUM, Living Lab Fellow), Kylie Garcelon (HGMT, Living Lab Associate Fellow), and Joanne Jacus (HGMT) participated in “The Art of Food,” a learning community between the Hospitality Management and Humanities Departments. Entry-level students enrolled in their first lab courses, either Professor Jacus’s Baking and Pastry I (HGMT 1204) or Professor Garcelon’s Culinary I (HGMT 1203), came together in Professor Cheng’s art history course dedicated to studying the history of photography (ARTH 1100). One objective of the learning community was to foster stronger bonds between Hospitality students in order to emphasize the importance of teamwork, an essential practice for success in culinary labs and in the daily operations of commercial kitchens. M.F.K. 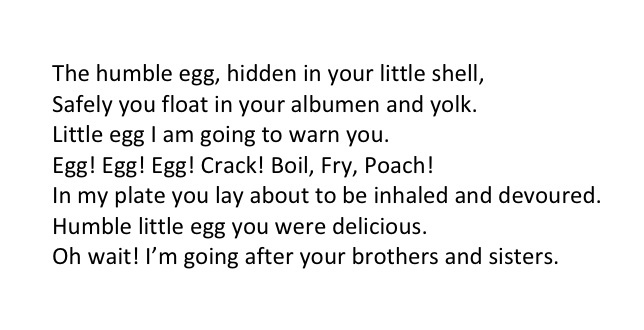 Fisher’s “How not to boil an egg” provided the theme for the learning community as a shared reading between all three classes. Students engaged with the Fisher reading in individual sections as well as in a shared dining experience, in which faculty and students dined together. The shared meal included a shared poetry writing exercise that reinforced the structure of group work promoted in culinary labs and in the art history class. 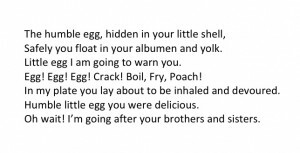 Whether in culinary labs or the lecture class, students were asked to contemplate creative expression in a myriad of ways, which included considering the visual elements of culinary production, the study of poetry in culinary labs, or taking photographs of eggs for group projects on important photographers. 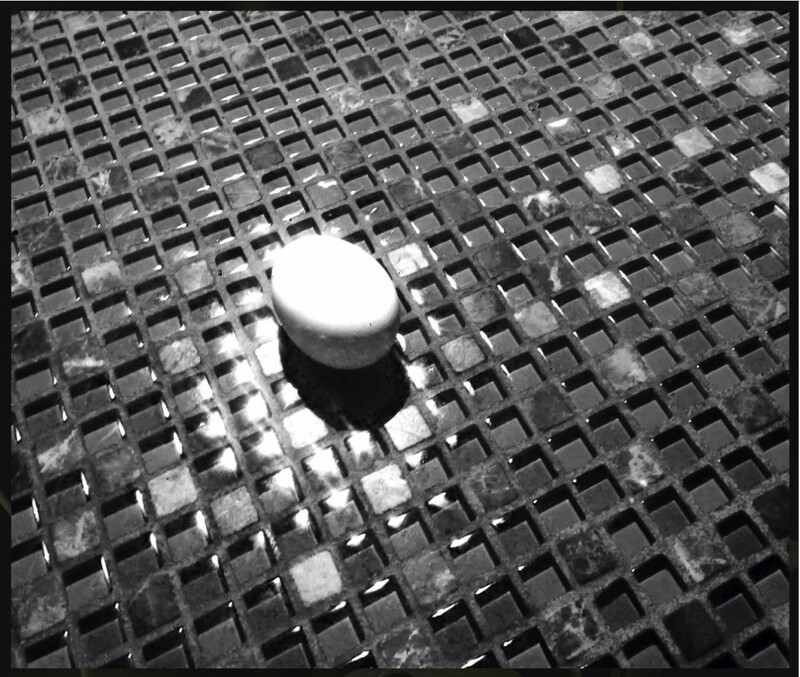 All three classes shared a central website on the OpenLab for the learning community, which was filled with student reflections and examples of student photography. The learning community culminated in smart phone photo contest, from which the winning photos will be exhibited in City Tech’s Janet Lefler Dining Room. Spring 2015 OpenLab Workshop Schedule and Office Hours! INTERESTED IN FINDING OUT MORE ABOUT CITY TECH’S OPENLAB? JOIN US FOR A WORKSHOP! 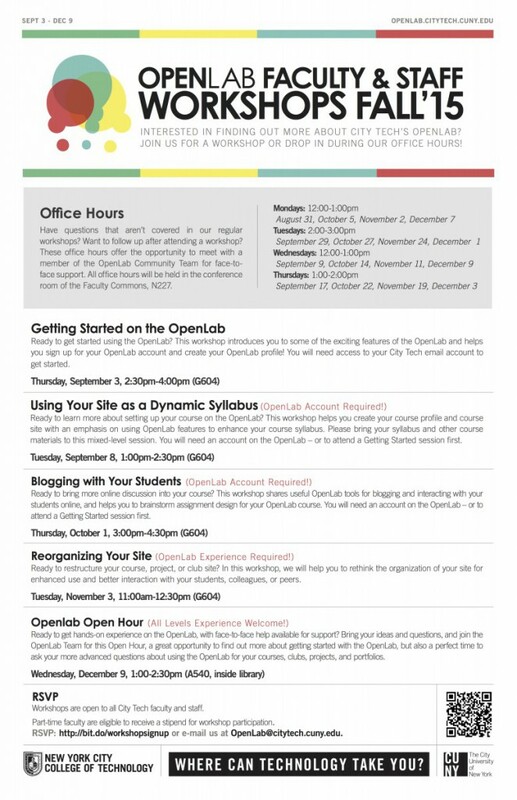 Find out how to collaborate with your students and colleagues on the OpenLab in these introductory sessions. You will need access to your City Tech email account. RSVP: http://bit.ly/1nwXRnL, or email us at OpenLab@citytech.cuny.edu. Please include workshop date(s) and time(s). Have questions that aren’t covered in our regular workshops? Want to follow up after attending a workshop? These office hours offer the opportunity to meet with a member of the OpenLab Community Team for face-to-face support. All office hours will be held in the conference room of the Faculty Commons, N227. Ready to learn more about setting up and designing a course on the OpenLab? Bring your questions to these mixed-level sessions, along with your syllabus and other materials. Discuss and brainstorm assignment design for your OpenLab course, as well as course set-up and useful tools for blogging with your students. Now that you’ve been working on the OpenLab, learn how to structure your site for improved interaction with your students or colleagues. Ready to get hands-on experience on the OpenLab, with face-to-face help available for support? Bring your ideas and questions, and join the OpenLab Team for this Open Hour, a great opportunity to find out more about getting started with the OpenLab, but also a perfect time to ask your more advanced questions about using the OpenLab for your courses, clubs, projects, and portfolios. Workshops are open to all City Tech faculty and staff. Part-time faculty are eligible to receive a stipend for workshop participation. RSVP: http://bit.ly/152nATa or email us at OpenLab@citytech.cuny.edu. Please include workshop date(s) and time(s). “A Living Laboratory: Revitalizing General Education for a 21st-Century College of Technology” is a five-year initiative (2010-2015) funded by the U.S. Department of Education’s Strengthening Hispanic-Serving Institutions (Title V) program. Its mission is to re-envision General Education at City Tech as a “living laboratory,” using City Tech’s signature strengths: hands-on experiential models of learning and our vibrant Brooklyn Waterfront location. 4) The Brooklyn Waterfront Research Center: builds an endowment to support student and faculty research at this newly-created City Tech institution. We are currently seeking full-time and part-time faculty members to join the General Education Seminar Associate Fellows Program in Spring 2015. As an Associate Fellow you will become part of the growing interdisciplinary community at City Tech that is enthusiastically engaged in this transformational effort. – What changes can we make to the student experience that will not just prepare our students to succeed at City Tech, but also support creative, original, and critical thinking through the use of high-impact educational practices? – How can we use one of City Tech’s greatest assets — its location within the “living laboratory” of the downtown Brooklyn waterfront — to create hands-on, place-based learning opportunities with our students? – How can we use the City Tech OpenLab, an open-source digital platform, to customize learning experiences for our students that will engage them in the intellectual fabric of our College and make their achievements visible to our own community and to the wider public? 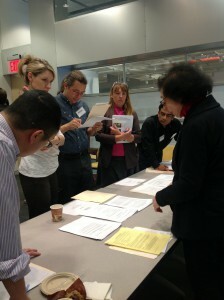 Associate Fellows – who may be part-time or full-time faculty members – will participate in five workshops during the Spring 2015 semester that focus on General Education and the following: High-Impact Educational Practices, Place-Based Learning, Assessment, and working with the City Tech OpenLab, our open digital platform for teaching and learning. Associate Fellows will be guided by full-time Gen Ed Seminar Fellows, who are responsible for sharing what they’ve learned, with the goal of disseminating the Seminar findings to the entire faculty community. – willing to implement what you have learned in your classroom and on the OpenLab in Fall 2015. Work done as part of this project is vital service to the College. Active participation by full-time faculty is recognized as service to the College; part-time faculty will receive a stipend of $600 ($120 per workshop attended) and an additional $240 for completion of a final project. For this final project, each Associate Fellow will create and document an exemplary activity that incorporates Living Lab best practices into their classwork (a standard template will be provided). Please contact Living Lab General Education Seminar Co-Directors Mary Sue Donsky (msdonsky@citytech.cuny.edu) or Sandra Cheng (scheng@citytech.cuny.edu) if you have questions or need additional information. 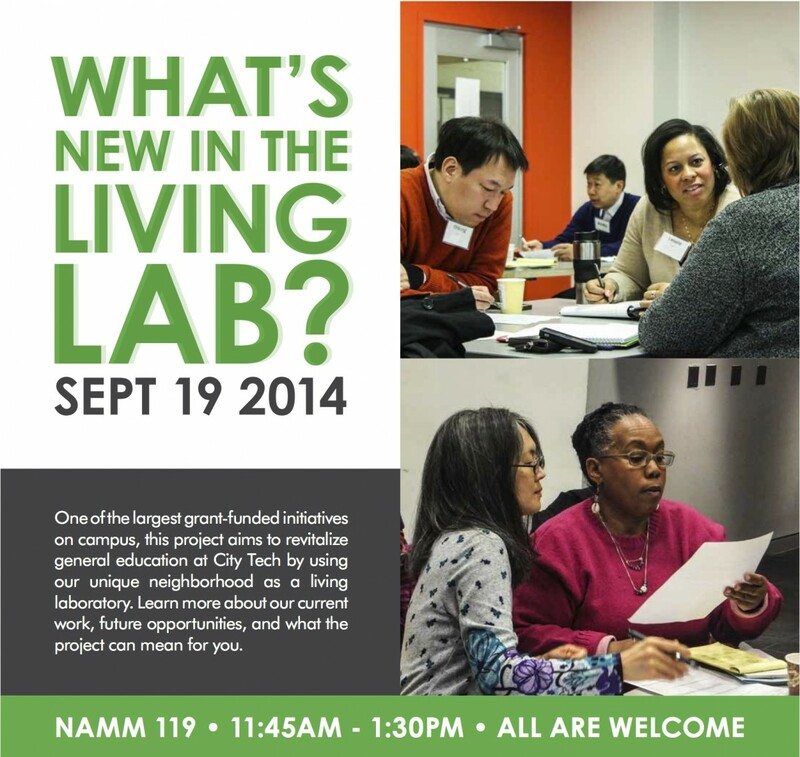 Sept 19: What’s Happening in the Living Lab? 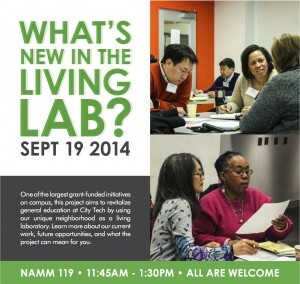 Come and find out what’s been happening in the Living Lab on Friday, September 19, 2014 in Namm 119, 11:45 am-1:30 pm. The dissemination event is open to all. See what your colleagues have been doing in the Living Lab. Take a break, grab a little lunch, and even think about different approaches to your own classroom. Hope to see you there! Fall 2014 OpenLab Workshop Schedule, Register Now! Ready to learn more about setting up and designing a course on the OpenLab? Bring your questions to these mixed-level sessions, along with your syllabus and other materials. You will need an account on the OpenLab – or attend a Getting Started session first. Discuss and brainstorm assignment design for your OpenLab course, as well as course set-up and useful tools for blogging with your students. You will need an account on the OpenLab – or attend a Getting Started session first. Part-time faculty are eligible to receive a stipend. RSVP: http://bit.ly/1nwXRnL Questions? Email us at OpenLab@citytech.cuny.edu. Faculty from a wide range of disciplines gathered for the “Real World Problem Solving” meeting to hear final presentations by Associate Fellows and their Living Lab facilitators. After a series of workshops, the latest cohort of Associate Fellows presented creative examples of pedagogical activities to their peers, Living Lab facilitators, and the greater CityTech community. The gathering began with reflections from Third Year Fellows Aida Egues, Jill Bouratoglou, and Robert Leston, who spoke of their Living Lab involvement and its impact on their teaching and professional development. The Associate Fellows showcased their works-in-progress by adapting an unusual structure for academic presentations. Taking a cue from speed dating, each Associate Fellow took 2 minute-turns to present an activity to small groups that rotated around the workspace from one presenter to the next. Faculty ranging from Construction Management and Civil Engineering to Dental Hygiene and Human Services presented and listened to mini presentations from their colleagues across the college. Gathering in small, intimate groups, each participant had ample opportunity to listen, learn, and ask questions of their peers. 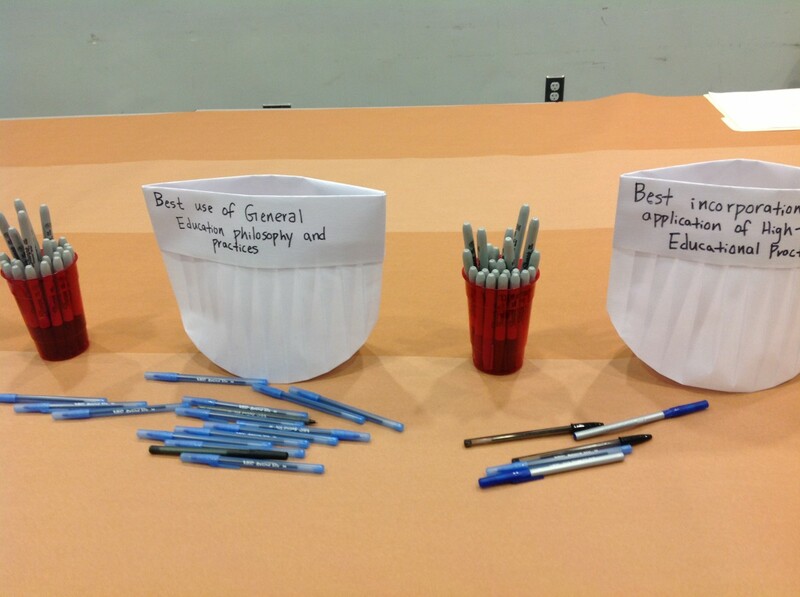 All attendees were given the opportunity to vote for what they thought were the best engagements with issues of Assessment, Place-Based Learning, High Impact Educational Practices, and General Education but in reality all presenters were winners for every professor revealed their passion for teaching and strong commitment to student learning. The gathering culminated in a graffiti activity in which all attendees had a chance to visually express their interests, frustrations, and aspirations. 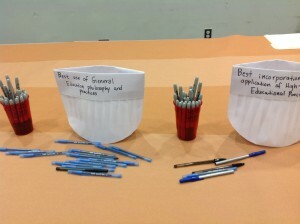 Participants left with an arsenal of new ideas and new strategies to use in their own classes and much to reflect on. 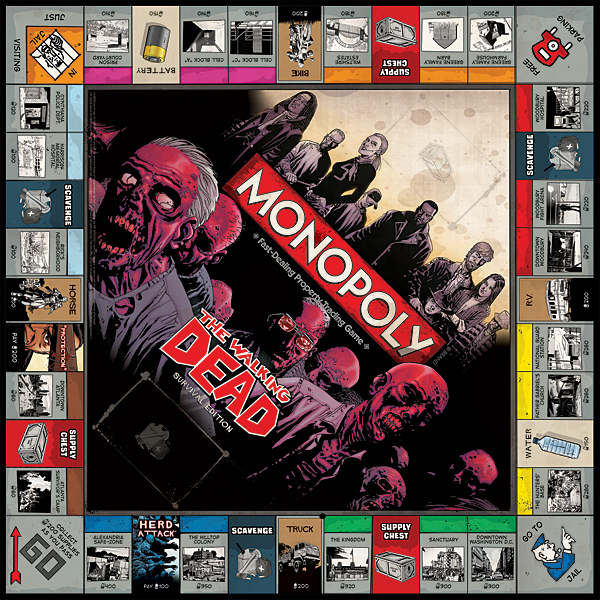 In Professor Robert Leston’s upper-level course ENG 3402 Topics in Literature on Vampires and Zombies in Popular Fiction and Film, students explored the popularity of the undead in popular literature, film, and TV. Using a hybrid course format, in which students met once per week face-to-face and numerous times online, Professor Leston depended on his OpenLab class website for discussion and the submission of reading responses for fellow students to read and comment on. The OpenLab became an online meeting space to explore the fascination with vampires, werewolves, zombies, and monsters in American popular culture. From reading classics such as Bram Stoker’s Dracula, Franz Kafka’s The Metamorphosis and contemporary academic critiques to watching excerpts of film and TV like Shaun of the Dead and Buffy the Vampire Slayer, students submitted reflections and critical responses to readings and viewings on the class website in order to create a virtual ‘reading journal.’ Open to all classmates and the larger CityTech community, the class website extended the learning experience beyond the walls of the classroom and invites outsiders to look in. Students used the OpenLab to access readings and media clips too as well as to stay on top of the work of fellow students in order to avoid overlap with other student projects as each took turns to lead group discussions as ‘expert readers.’ The OpenLab offered a vast range of interaction for professor and students in a hybrid class. Take a peek at a student’s ‘reading journal’, another student’s response to a reading that contrasts Steve Jobs the vampire to Bill Gates the zombie, and a selection of class readings and media clips.